Background: Informed Consent is a fundamental prerequisite to undertaking ethical research. There are series of complexities associated with the administration of Informed Consent form in developing countries. This study aimed to identify the views of dental patients and dental professionals in Jos, Nigeria toward the need for Informed Consent prior participation in dental clinical research. Materials and Methods: A self-administered questionnaire based cross sectional study. It sought to know participants' views about Informed Consent process and prior involvement in clinical research. Non-probability, purposive sampling technique was used to select the study population. Analysis was done by the use of SPSS 17. Results: A total of 152 participants answered the survey questionnaires; 121 patients and 31 Dental professionals. Age range was 18-70 years, M: 51%, F: 49%. 27 (17.8%) participants had been involved in clinical research before. 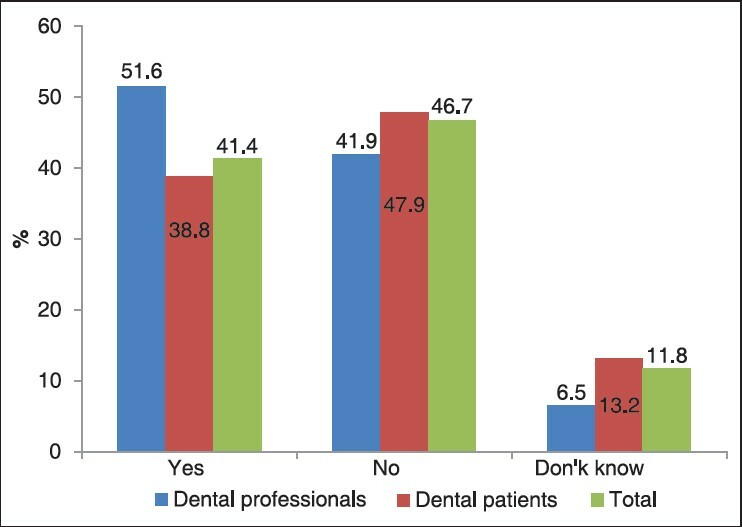 Comparatively, dental patients have more understanding of the term ''Informed Consent'' (P > 0.05). Both patients (93.5%) and dental professionals (89.3%) agree strongly that Informed Consent is important to clinical research though ironically, nearly half (48.7%) of the participants do not have any idea of what Informed Consent entails. Also, 84.2% of the respondents think they should be asked of their consent before conducting a clinical research wherein they are the subjects. Conclusions: Though both the dental patients and professionals agree that Informed Consent is important to clinical research and that they should be asked of their consent before participation in clinical research, ignorance of what it actually entails is apparent among these groups. While Informed Consent for medical research has become normative in the developed countries, this is not the case throughout Africa. Guidelines for obtaining Informed Consent in sub Saharan Africa are often difficult to implement because of low literacy levels, socio-economic, and cultural factors. The local ethics committees, whose role is critical in Informed Consent, are weak, ill-equipped or non-existent in some countries. Using the Western oriented consent seeking procedure in poor resource settings, individuals may participate in a trial without adequately understanding the issues involved. Unlike most developed countries; Nigeria does not have national guidelines specifying the type of information to be provided patients in the consent form. Though Nigeria follows the Western model of Informed Consent such as the one based upon the U.S. regulations under the Food and Drug Administration which follows ICH standards, , a high level of reading skill and comprehension is necessary to understand and complete most consent forms that are currently used for participation in clinical research studies. A lot of complexities are associated with the administration of Informed Consent form in developing countries like Nigeria. For example, the information sheets and consent forms borrowed from developed countries may contain technical concepts not familiar to research participants in developing countries. It may be too sparse or too complicated, or research participants may not be given a satisfactory opportunity to ask questions and have their personal worries and interests addressed. Religious and cultural hindrances as well as low socio-economic status of the people is also a challenge to passing adequate information to the patients or research subjects. Language barriers are a major difficulty in understanding Informed Consent. For example, the word ''research'' does not have a corresponding term in the local languages of Northern and Southern Nigeria. The fact that a majority of the clinical trials take place within public health facilities, participants may not be able to discern between routine care and research. Some subjects may not even be aware that they are participating in research. Though the research participant, as a lay person, is unlikely to understand fully the scientific basis and needs for Informed Consent in a specific research endeavor as opposed to the researcher or a medical expert, there are differential perspectives between lay people and investigators (Clinicians) regarding the relative importance or need of certain disclosed elements of the informed consent. , This study therefore aimed to identify the views of dental patients and dental professionals in Jos, Nigeria toward their knowledge and perceived need for Informed Consent prior participation in dental clinical research. It was a descriptive cross sectional study. A survey of dental patients and dental care professionals in outpatient dental settings in Jos, Nigeria to determine their knowledge and considerations toward the need for Informed Consent prior to participation in dental clinical research. 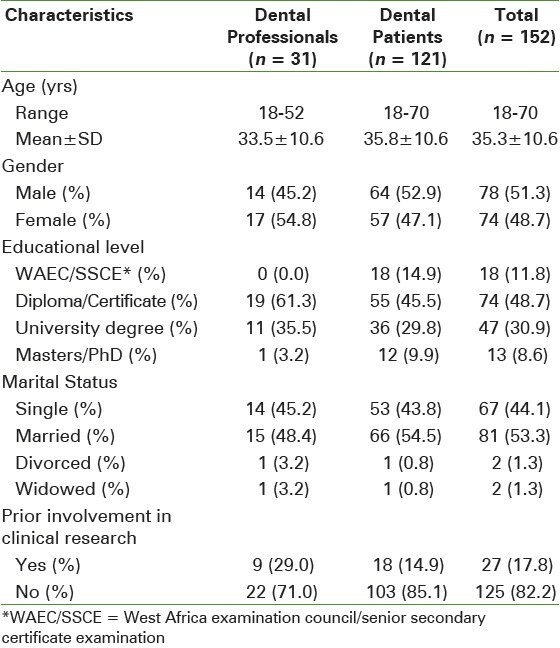 Adult dental patients (defined as 18 years and above) with a minimum of secondary school education and dental care professionals were included in this study. For the purpose of the study, a dental care professional was defined as a person who by virtue of normal duties, obligations and /or training has some form of clinical contact with dental patients in the dental clinics. Included in this study were: Dentists, Dental Therapists and Dental Health Technicians. These are the available dental clinical personnel in this part of the country. The study took place at the outpatient department of three public dental clinics located within Jos in Plateau state, Nigeria. These are the Inter-country Centre for Oral Health (ICOH) for Africa, Air Force Dental Clinic and Government Dental Clinic. Non-probability, purposive sampling technique was used to select the study population. Adult dental patients meeting the inclusion criteria who came to the clinic for routine dental checkup/treatment and dental care professionals in these dental clinics were given a participant information sheet (PIS) which detailed what the study was about. Those who were willing to complete the questionnaire filled an attached consent form. Dental care professionals were approached by one of the authors in their offices while copies of the PIS and data collection instrument was circulated to the dental clinics (cited above through fellow dentists in the clinics) for onward administration to prospective dental patients (at the waiting room) who met the inclusion criteria for consent to participate in the study. Data collection was by the use of self-administered paper based questionnaires. The questionnaire was adapted from similar validated instruments from previous studies to accommodate the needs of this study. , The variables of interest included participant's demographic information, their knowledge of Informed Consent, and prior participation in a clinical research. Others are their views on the importance of Informed Consent to clinical research, if Informed Consent is a legal document, if they think they must be asked for consent to carry out a clinical research in which they are the subject and if they think they can change their minds after signing the consent form. The questionnaire was anonymous and consisted of mainly close ended questions and a few open ended questions. The same questionnaire was used for both groups (dental patients and dental professionals). A pre-test of the questionnaire was conducted with five patients who had no difficulties navigating and filling the questionnaires. It was adjudged that the words and sentences used in the questionnaire were clear and understandable appropriate to the participant's literacy level. No correction was made on the questionnaire as it was found to be sensitive enough for data collection. Filled questionnaires were retrieved by one of the authors from the three Dental clinics. Each filled survey questionnaire was checked for errors, incomplete filling, or multiple entries. Those with irreconcilable errors and multiple entries (where a single entry was required, n = 3) were discarded. An open ended question which required that participants define (explain) what they understood by ''Informed Consent'' was marked by one of the authors and recorded as either Correct knowledge, Partial knowledge or No knowledge (based on ICH-GCP Guidelines definition of Informed Consent as "a process by which a subject voluntarily confirms his or her willingness to participate in a particular trial, after having been informed of all aspects of the trial that are relevant to the subject's decision to participate''). The open ended questions were coded and a variable registry was developed for data entry into the computer database using Statistical Package for Social Sciences version 17 (SPSS v 17). Analytic methods used for the quantitative data include descriptive statistics, which include the following: Frequencies, percentages and measures of central tendencies. Chi-squared test was used to analyze categorical data. A P-value of < .05 was taken as statistically significant. The overall study procedure was approved by the International Online Research Ethics Committee of the University of Liverpool. This was sequel to obtaining a local ethical clearance for the study from the Health Research Ethics Committee (HREC) of the Plateau State Specialist Hospital, Jos. The dental clinics used also gave authorization letter to conduct the study (for those that do not have an ethical committee) and an ethical clearance for the site that had an ethical committee. 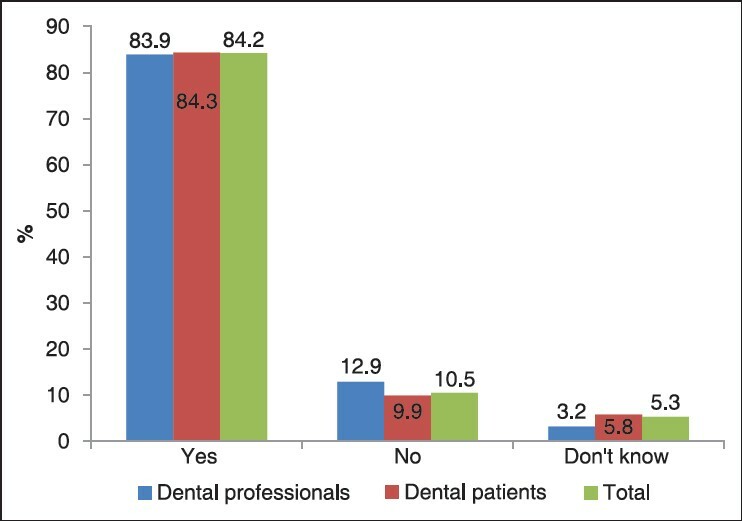 A total of 152 participants answered the survey questionnaires, 121 (79.6%) patients and 31 (20.4%) dental professionals. There were more females (17/31, 54.8%) among the dental professionals compared to the dental patients (57/121, 47.1%) though cumulatively, the gender distribution was close (M: 51%, F: 49%). Only 27 (17.8%) participants had been involved in clinical research before. 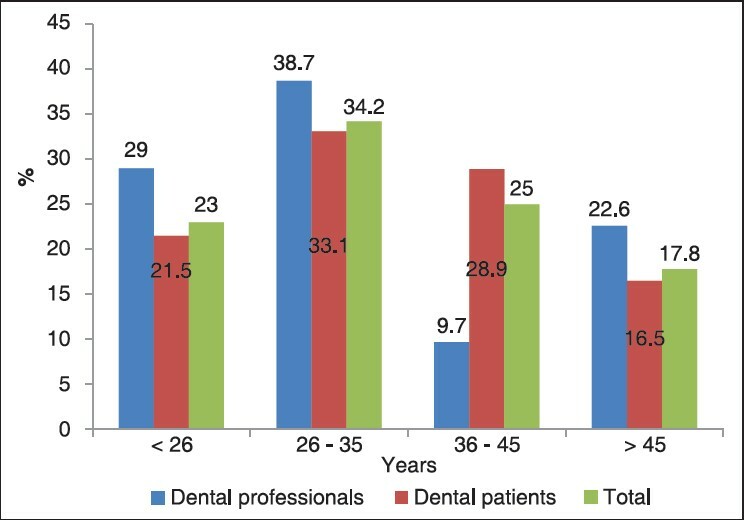 [Table 1] summarizes the demographic distribution of the participants comparing dental professionals with the dental patients while [Figure 1] shows the age distribution per group. The different cadres of dental professionals represented in this survey were Dental Therapists (8, 26%), Dental Health Technicians (16, 52%), and Dentists (7, 22%). Nearly half (48.7%) of all the participants do not have any idea of what Informed Consent entails. This bulk is inclusive of 54.8% of the dental professionals. Approximately, one-third (30%) each among the two groups (dental patients and dental professionals) have partial understanding of Informed Consent. 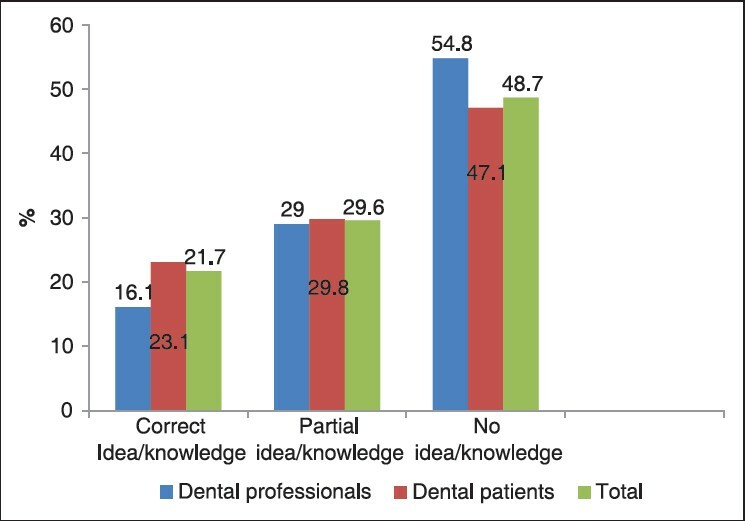 Comparing the level of knowledge of Informed Consent among the two groups, [Figure 2] shows that dental patients have more understanding of the term "Informed Consent" though this finding is not significant (P > 0.05). Advancement in education increases the comprehension of Informed Consent (P = 0.051). 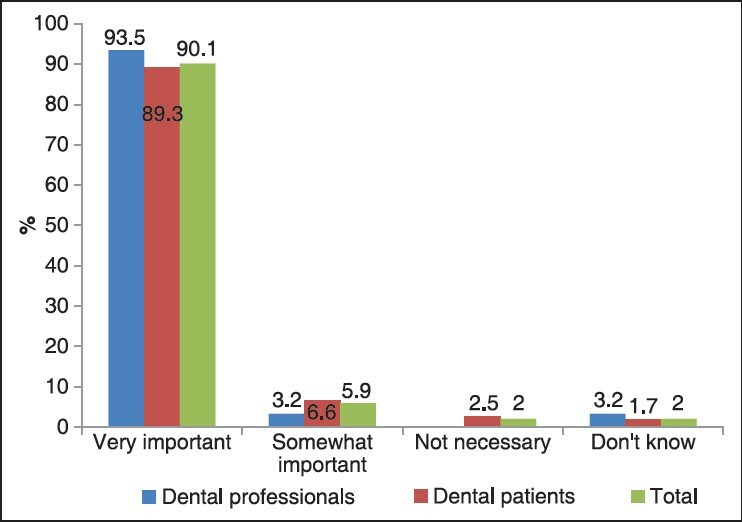 [Figure 3] shows clearly that most patients (93.5%) and dental professionals (89.3%) agree strongly that Informed Consent is important to clinical research. This is also directly proportional to increasing educational level (P < 0.05). The figure also shows that less than 5% of the respondents deem Informed Consent as not necessary for clinical research out of which none is from the dental professionals. Also, more than 80% of the respondents think they should be asked of their consent before conducting a clinical research wherein they are the subjects while about 10% think otherwise [Figure 4]. More of the dental professionals believe that the Informed Consent form is a legal document compared to the dental patients. About 10% of the dental professionals do not think the Informed Consent form is a legal instrument while around another 10% is not sure [Figure 5]. Figure 4: Do you think you must be asked for consent to carry out a clinical research in which you are the subject? Figure 5: Is the informed consent form a legal document? [Figure 6] shows that more than half (51.6%) of the dental professionals think they can change their minds after signing a consent form. A greater proportion of the dental patients (47.9%) do not think they can change their mind after signing the consent form. Proportion wise, those who do not know if they can change their minds after signing the consent among the dental professionals (6.5%) are approximately half of that of the dental patients (13.2%). Figure 6: Do you think you can change your mind once you sign a consent form? The results of this study suggest that the respondents had less than average understanding of the term ''Informed Consent.'' Bioethics as a whole is still an evolving area in Nigeria with research ethics gradually having a foothold in research activities in the country. As a result, many of the studies done in the country do not (yet) have a formalized Informed Consent process which may explain the partial to no understanding of the process by some of the participants. More of the dental professionals are unaware or lack knowledge of the term Informed Consent partly because introduction of Bioethics in some of the Dental Schools in the country is a very recent development. Bioethics has not been introduced in any of the Health Technology schools where Dental Health Technicians and Dental Therapists are trained. More so, the Dentists and Dental Therapist who have ''direct'' clinical contact with the patients are outnumbered by the Dental health Technicians (in this study) who by training do not administer treatment but rather play a supportive role. Thus, they primarily do not seek for the patients consent before administering treatments. Some of the dental professionals who exhibited correct understanding of the term may be as a result of affiliation to a research center where one of the clinics used for the study is based and/or attendance at dedicated Bioethics seminars. Since it is customary to discuss treatment options with patients, seeking their approval before commencing, such a practice could account for the correct understanding of Informed Consent exhibited by the dental professionals. Other plausible explanations of the number of people who understood Informed Consent are those who claimed to have been involved in Clinical Research before. Though the number of participants who claimed to have been involved in clinical research is low (17.8%), it is believed that this number is still high as the prevalent type of research conducted in this area are observational studies. The participants may not be able to differentiate clinical research from observational research. Nevertheless, such research activities could have exposed them to the concept of Informed Consent. This study also found a direct correlation between increasing educational attainment, the understanding of Informed Consent and the notion that Informed Consent is important to clinical research. It is probable that some of the respondents in the pursuit of their academic degrees had dissertations/thesis dealing with human subjects wherein the concept of Informed Consent was utilized. Despite the ignorance identified from most of the participants on their understanding of Informed Consent, it was an irony to see that most of them (90%) view Informed Consent as very important to clinical research (including those that do not even have an idea of what it entails). It is believed that the understanding garnered from the participant information sheet (PIS) and the attached consent form given to them before the study had influenced their views. This presupposes the need to encourage the use of PIS and/or consent forms written in low reading scales for research participant's comprehension of a study before consenting to it. The PIS could also clarify why more than 80% of the participants think they should be asked for consent to carry out clinical research in which they are a subject since a portion of the PIS stated explicitly that: " If you wish to take part in it (the study), please sign the attached consent form." This statement can also clarify why more than 80% of the respondents think they must be asked for consent to carry out a clinical research in which they are the subject despite being ignorant of what Informed Consent is. There are some limitations to this study. First, it involved only three dental clinics which might not be representative of the dental clinics in the state, talk less of the whole country. Secondly, the study was based on purposive sampling (a non-probability sampling method) which means that the findings may not be generalizable to the whole population. Restricting the study to those with a particular level of education (ability to read Basic English) also confers on them some potential socio-economic benefits in contrast to the ''ideal'' research participant who may not be learned, poor and ignorant of the concepts discussed. Lastly, awareness of Dentistry as a profession and practice in the northern part of Nigeria (where the study took place) is still very low compared to the southern part of the country which is more established in Dentistry. It is possible that if this study had been conducted in the south, responses might have been slightly different than those obtained. 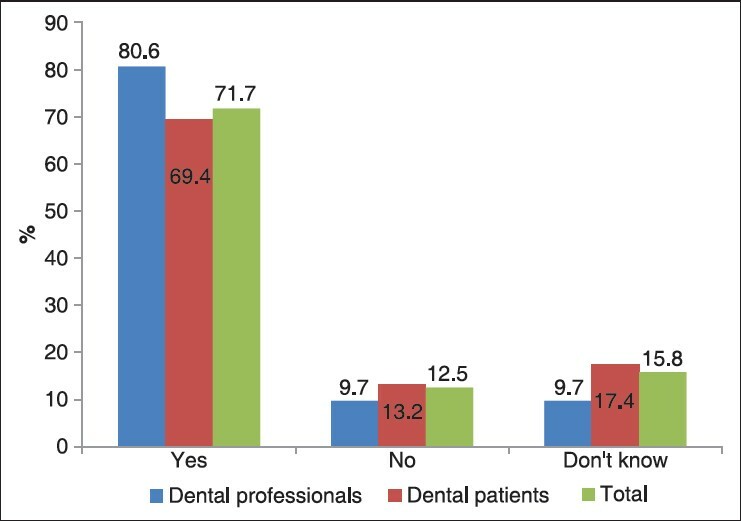 Notwithstanding, this study had been able to give a snapshot of the views of dental patients and dental professionals in a developing country as regards what they think Informed Consent is. This study has shown that both the dental patients and professionals agree that Informed Consent is important to clinical research and that they should be asked of their consent before participation in clinical research in which they are a subject. Despite this, the study also reveals the ignorance of what Informed Consent is among the groups. Informed Consent requires that patients/participants are provided with all relevant information about a proposed procedure or treatment prior to obtaining their consent to carry out the procedure or treatment. This is very important because trial conducted on people is usually remote to their primary area of discipline. Since as a lay person, it is unlikely to understand fully the scientific basis and implications or risks of a specific research endeavor as opposed to the researcher or a medical expert. The use of a participant information sheet (PIS) in this study had shown that it can augment the understanding of research subjects to the concept of Informed Consent though this should be subjected to a formal study. Efforts should also be made to assess participants' comprehension of the process post Informed Consent administration. 1. Beckerman NL. Informed Consent. Encyclopedia of Death and Dying (n.d.) [Online] Available from: http://www.deathreference.com/Ho-Ka/Informed-Consent.html [Last assessed on 2012 Aug 11]. 2. World Health Organization. World medical association declaration of helsinki: Ethical principles for medical research involving human subjects. Bull World Health Organ 2001;79:373-4. 3. Agoritsas T, Perneger TV. Patient-reported conformity of informed consent procedures and participation in clinical research. QJM 2011;104:151-9. 4. Chanaud CM. Determination of required content of the informed consent process for human participants in biomedical research conducted in the U.S.: A practical tool to assist clinical investigators. Contemp Clin Trials 2008;29:501-6. 5. International Conference on Harmonization of Technical Requirements for Registration of Pharmaceuticals for Human Use (ICH). Guideline for Good Clinical practice E6(R1) 1996 [Online]. Available from: http://www.ich.org/fileadmin/Public_Web_Site/ICHProducts/Guidelines/Efficacy/E6_R1/Step4/E6_R1__Guideline.pdf [Last accessed on 2012 May 16]. 6. National organization of circumcision information resource centers. Informed Consent (2010). [Online] Available from: http://www.nocirc.org/consent/ [Last accessed on 2012 Aug 20]. 7. Tan LT, Jenkins H, Roberts-Harry J, Austin M. Should patients set the agenda for informed consent? A prospective survey of desire for information and discussion prior to routine cataract surgery. Ther Clin Risk Manag 2008;4:1119-25. 8. Hichens LP, Sandy JR, Rowland HN, McNair AG, Clark S, Hills D, et al. Practical aspects to undertaking research in the primary care setting: Experience from two studies. J Orthod 2005;32:262-8. 9. Hartman KM, Liang BA. Exceptions to informed consent in emergency medicine. Hosp Physician 1999;35:53-9. 10. Lema VM, Mbondo M, Kamau EM. Informed consent for clinical trials: A review. East Afr Med J 2009;85:133-42. 11. Ezeome ER, Chuke PI, Ezeome VI. Contents and Readability of currently used surgical/procedure informed consent forms in tertiary institutions in Nigeria. Niger J Clin Pract 2011;14:311-7. 12. US Food and Drug Administration. Guidance for Industry, E6 Good Clinical Practice: Consolidated Guidance (1996) [Online] Available from: http://www.fda.gov/downloads/Drugs/.../Guidances/ucm073122.pdf. [Last accessed on 2012 November 27]. 13. Tekola F, Bull SJ, Farsides B, Newport MJ, Adeyemo A, Rotimi CN, et al. Tailoring Consent to Context: Designing an Appropriate Consent Process for a Biomedical Study in a Low Income Setting. PLoS Negl Trop Dis 2009;3: e482. 14. Helgesson G, Ludvigsson J, Gustafsson S. How to handle informed consent in longitudinal studies when participants have a limited understanding of the study. J Med Ethics 2005;31:670-3. 15. Taiwo OO, Kass N. Post-consent assessment of dental subjects' understanding of informed consent in oral health research in Nigeria. BMC Med Ethics 2009;10:11. 16. Dunn LB, Jeste DV. Enhancing informed consent for research and treatment. Neuropsychopharmacology 2001;24:595-607. 17. Tait AR, Voepel-Lewis T, Robinson A, Malviya S. Priorities for disclosure of the elements of informed consent for research: A comparison between parents and investigators. Paediatric Anaesthesia 2002;12:332-6. 18. Degerliyurt K, Gunsolley JC, Laskin DM. Informed Consent: What Do Patients Really Want to Know? J Oral Maxillofac Surg 2010;68:1849-52. 19. Federal School of Dental Technology and Therapy Enugu. Academics (n.d.) [Online] Available from: http://fedsdtten.edu.ng/dentaltechnology.html. [Last accessed on 2012 December 3].